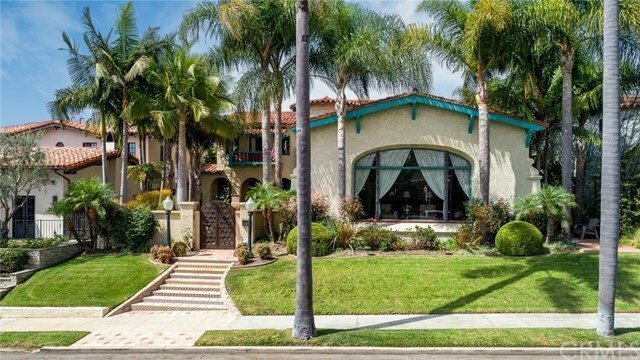 Exquisite Belmont Heights Estates Spanish Masterpiece with 5 Huge Bedrooms, 3 Bathrooms Built in 1929 with Stunning Original Character and Charm. Expansive 6,700 Sqft of Living Space Situated on a Grand 9,511 Sqft Lot. The 1st Floor Features a Formal Entry Leading to the Spectacularly Vast 1,140 SqFt Living Room with Stenciled Wood Beamed Supports, Huge Picture Window and Large Stone Fireplace with Custom Mantle. A Full Kitchen with Upgraded Appliances and Sun-Filled Breakfast Room Follows with a Large Formal Dining Room with Doors Leading to the Front Courtyard, a Family Room/ Study with Faux Fireplace, and Downstairs Bedroom with a Gorgeous Bathroom. Heading up the Large Staircase with a Sitting Rotunda there are 3 additional Bedrooms with Large Walk-In Closets, 2 Bathrooms, a Large Office with Ocean Views, and a Master Retreat with Tons of Closet Space and an Enclosed Balcony with Large Doors to Open for Ocean Breezes. Rounding off this Homes Wonderful Attributes are Great Outdoor Entertaining Spaces, Full Size Laundry Room with Sink and Pantry Storage, Basement/Wine Cellar and 3-Car Attached Garage with Additional Parking. Located within Walking Distance to Lowell Elementary, Rogers Middle School and the Local Boutique’s and Dining on 2nd Street. This is one of the most spectacular homes on the market, so don’t miss this opportunity to own this one-of-a-kind property.